After a grey and gloomy week during which we had three consecutive days of continuous rain and wind there was a possibility that today might stay dry, and even brighten up from late morning onwards, although the strong breeze would still be around to irritate and annoy. 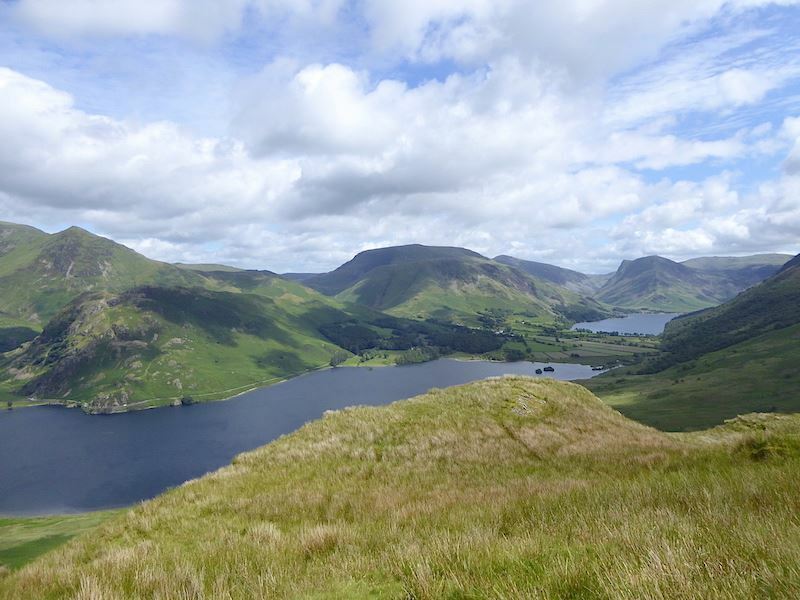 We decided to drive over to Buttermere and from there make a direct ascent up to the south top of Mellbreak. 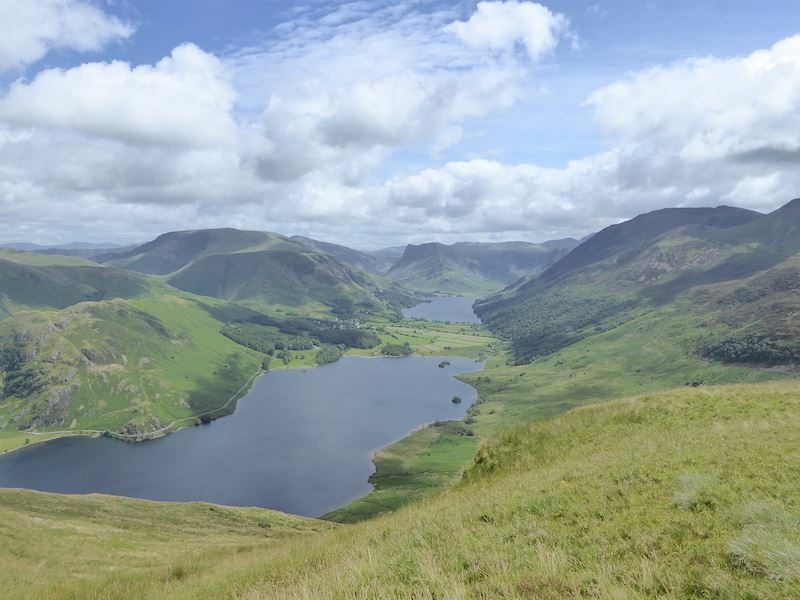 We didn’t make a very early start since the forecast mentioned that there might be the occasional shower lingering following the overnight rain, and the cloud base could be quite low to begin with, so we didn’t arrive in Buttermere until about quarter past ten. Not the best time to arrive in Buttermere during the holiday season if you want the free roadside parking, so we knew we would be more than likely to have to dip into the ‘parking tin’ and that turned out to be the case. After this costly sacrifice those fell tops had better be cloud free I thought. 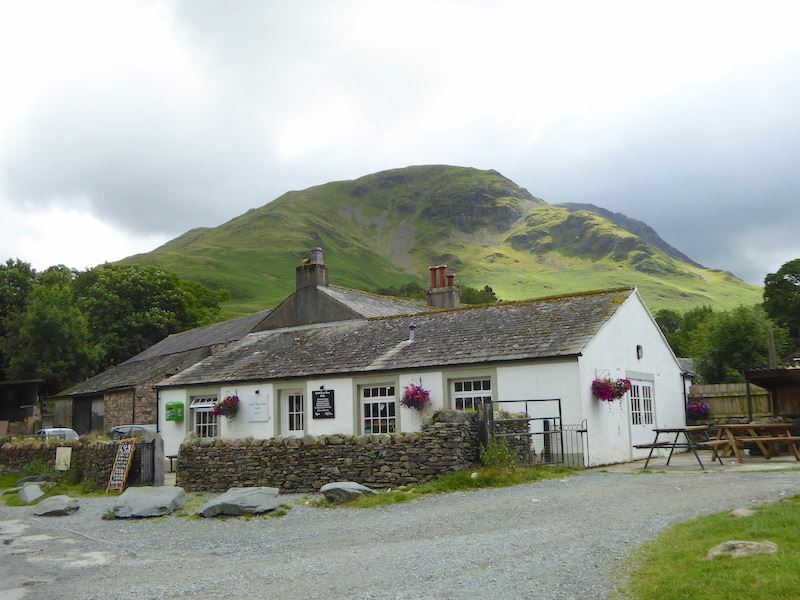 Starting out in Buttermere village with a view of High Snockrigg behind Croft House Farm Cafe. We’re about to join lots of other walkers walking along the lane on the left of the Fish Inn which is right behind me. From the lane we have the cheery sight of blue skies and a sunny spell brightening up the High Stile ridge on our left. 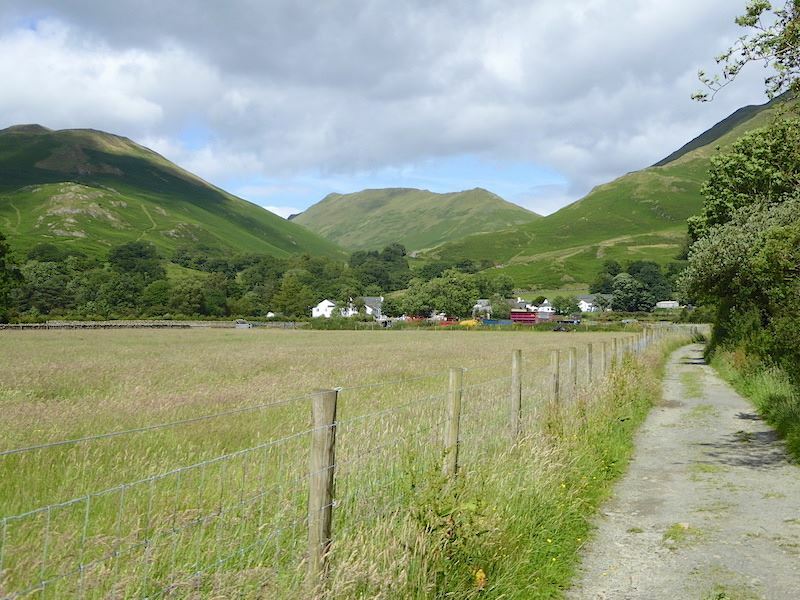 Just as the lane begins to curve around across the foot of Buttermere we leave it to go through a handgate and join the path, along the side of one of the fields, which will take us over to Scale Bridge. 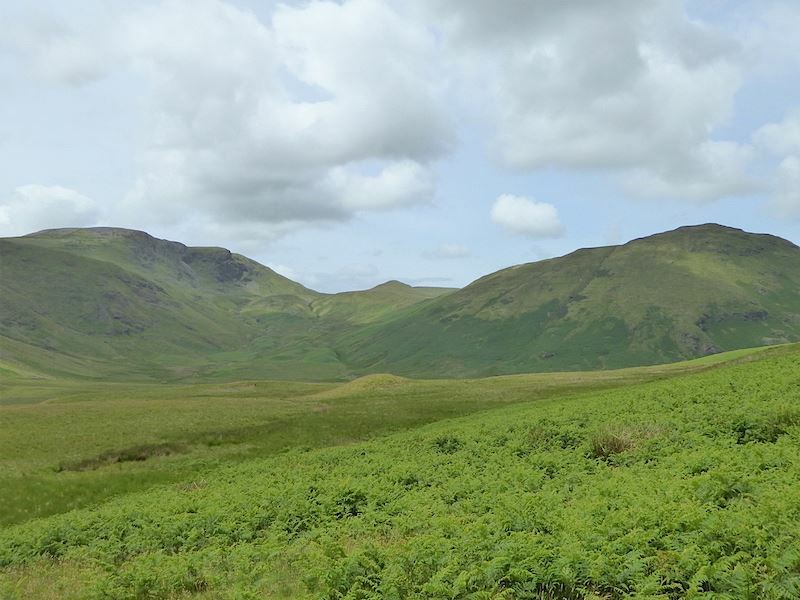 As we passed through the handgate we were asked if we were going to Red Pike by a couple who had stopped there to put a jacket in their pack. Not today we replied and continued on our way. A few yards further on it occurred to us that they might have been going up to Red Pike themselves and could have been hoping for clarification as to whether to take the path we were obviously going to follow or whether to continue to follow the usual one across the foot of Buttermere. On the other hand they could just have been making bit of friendly conversation as you do when you meet other walkers. 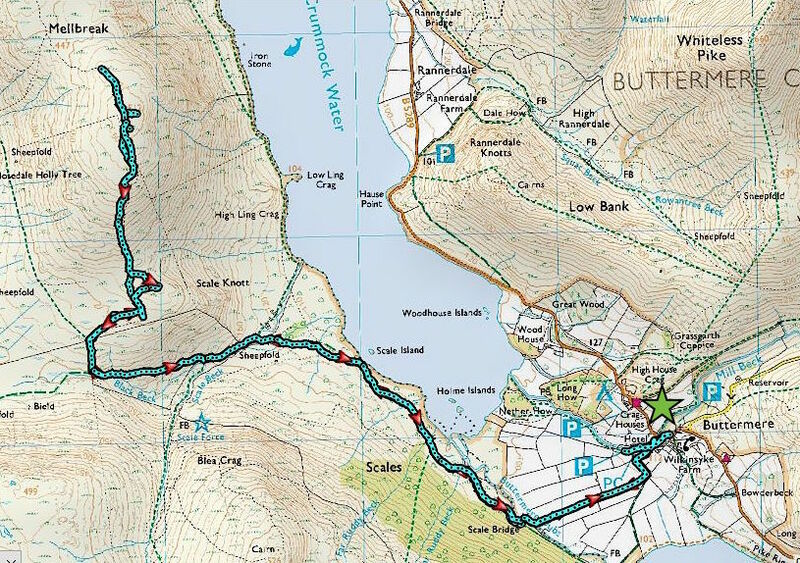 We had the feeling that it was the former especially as J said he had noticed that the male of the two had a map in his hand, but if we aren’t asked for assistance outright then we are careful not to offer it and inadvertently offend walkers who know exactly where they are going. Walking along the track towards Scale Bridge and the view over to our left is rather less than cheery with those heavy grey clouds still coming over from the west and hanging right above Mellbreak, the fell we are walking up today. There is a little hope on the horizon though as we can see a smidgeon of blue sky just behind the V shaped notch over to the right of the shot. 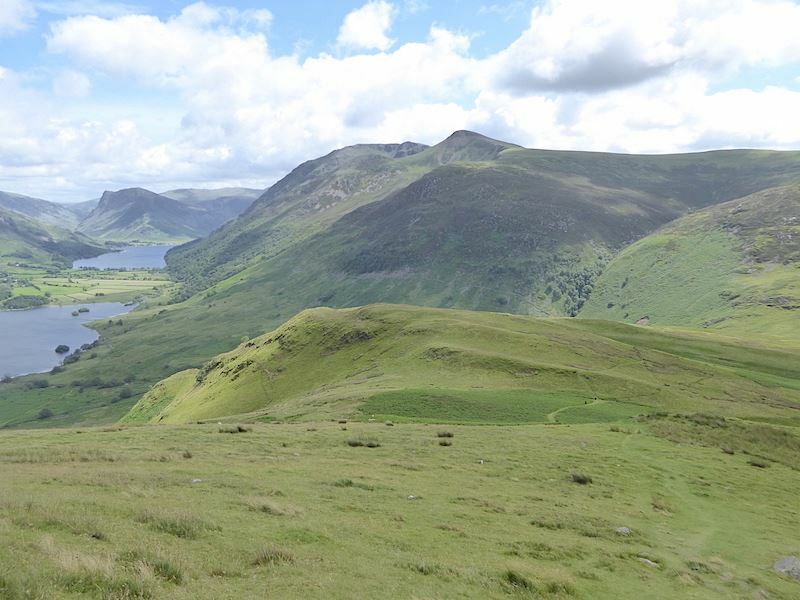 The track leads us over to Scale Bridge which crosses Buttermere Dubs, the narrow outflow from Buttermere to Crummock Water. Slowly but surely, as we walk along the path, the clouds begin to break up and patches of blue sky begin to appear. Nothing works quite so well in lifting the spirits as seeing a bit of blue sky and the occasional burst of sunshine. Ahead of us Mellbreak is waiting for our arrival, its been a good few years since we were last up there. To be precise, it was 2009 – I don’t believe it! 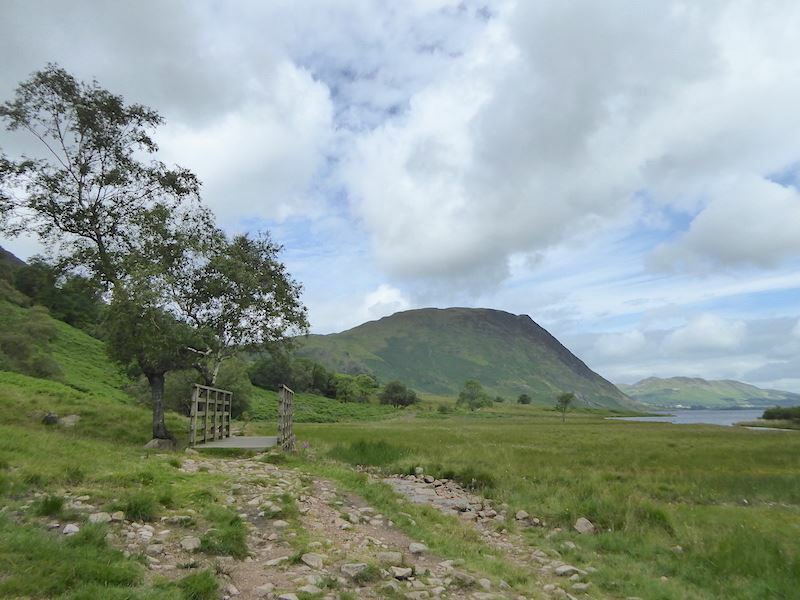 More or less opposite Scale Island, in Crummock Water, the path begins to swing away from the lakeside path and leads us towards Scale Beck. 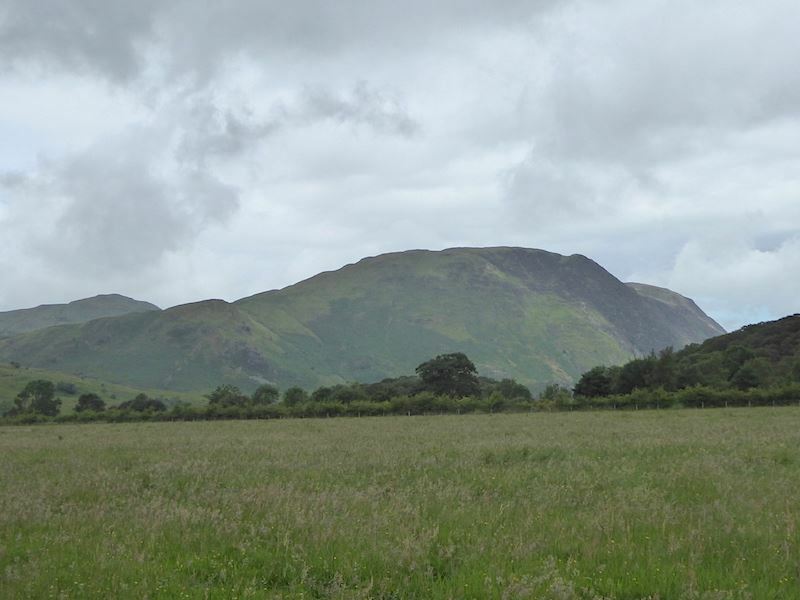 Ahead of us Scale Knott, on the left, with Mellbreak behind it are now fully in our view. 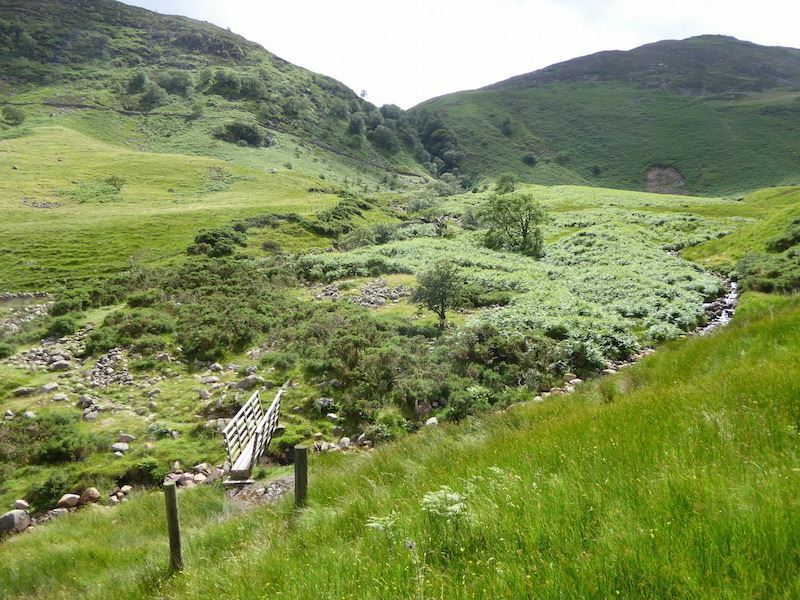 The bridge across Scale Beck with Scale Knott directly behind it. 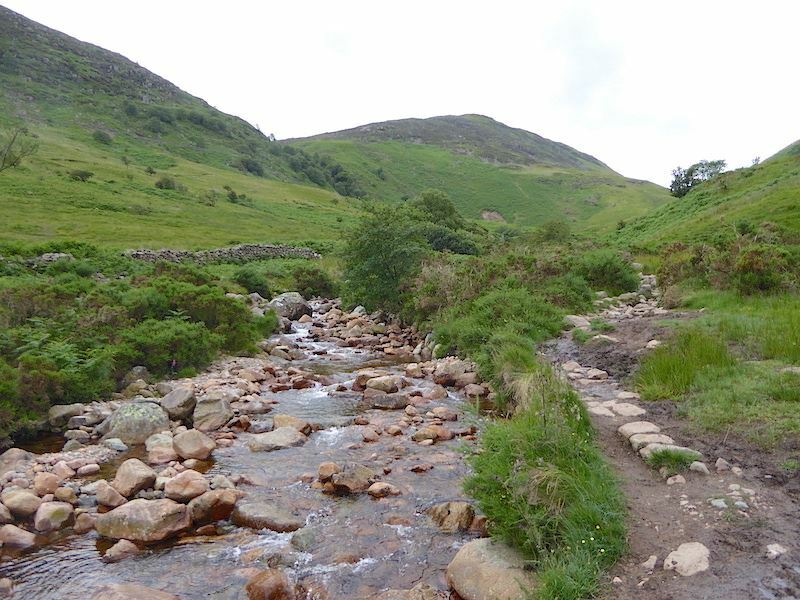 The path up to this point had been dry or soggy in just about equal measure but all that was about to change …..
….. across the bridge the path follows the course of Scale Beck for a short way before branching off up the steep hillside above Black Beck. 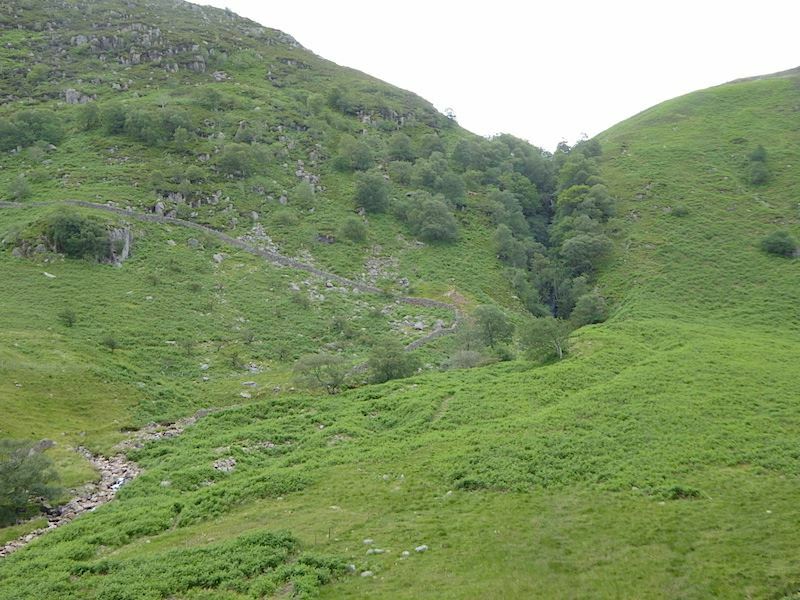 This lower section of the path was reasonable but the further and higher we went the worse it became. The stone path, which had obviously once been a decent laid one, has deteriorated quite badly and is in need of attention if the whole thing is not to be reduced eventually to an impassable quagmire. 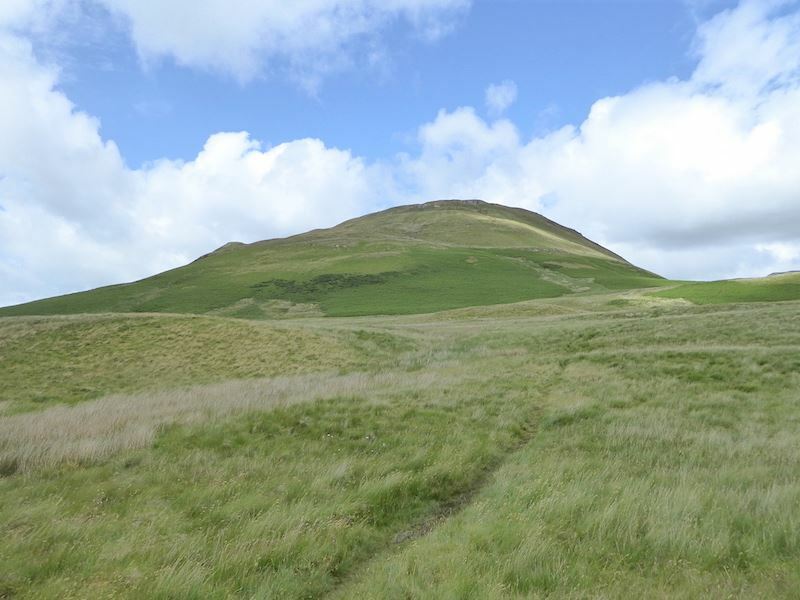 Higher up, what bits of path remained, saw the stones submerged under pools of water or claggy mud, consequently the ground alongside them had also been churned up as walkers tried to avoid walking through the often ankle deep mess which constituted the path. Getting up to the fence line at the top of the rise proved to be quite a trial in those conditions and from this point I took no more photos until we reached the stile. If I slip and get wet and muddy its hardly likely to be terminal, dropping the camera into all the soggy clag that we encountered was quite likely to be the end of it so it stayed packed away in its case. 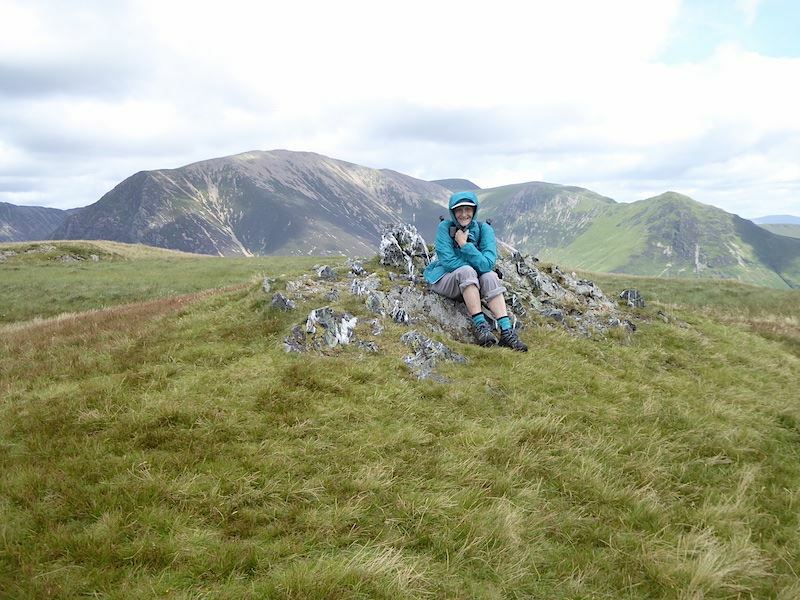 Back on dry ground at the stile on Scale Knott and a familiar view from a couple of weeks ago when we had a mosey round Mosedale and a walk up to Floutern Tarn. 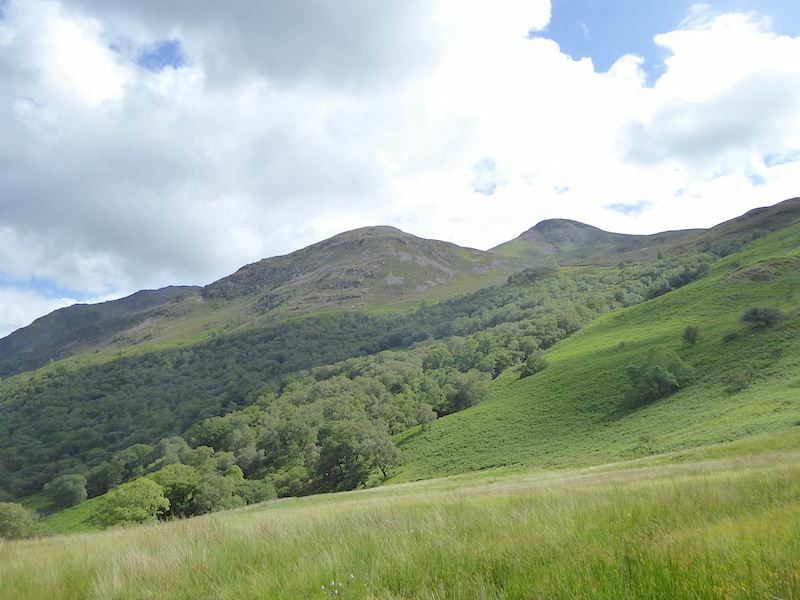 Floutern Cop is smack in the middle of the skyline with Great Borne and Hen Comb to its left and right respectively. 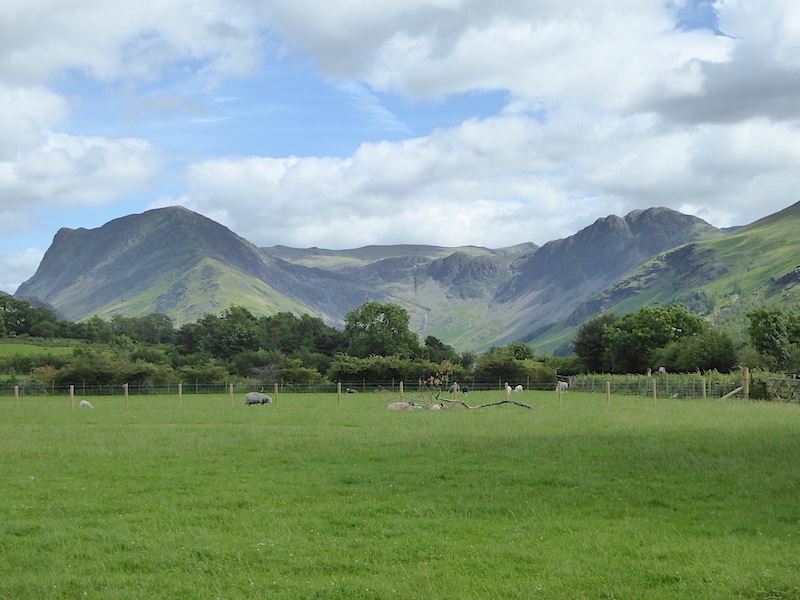 A look ahead to Mellbreak as we pick up the path across Scale Knott from the fence line. 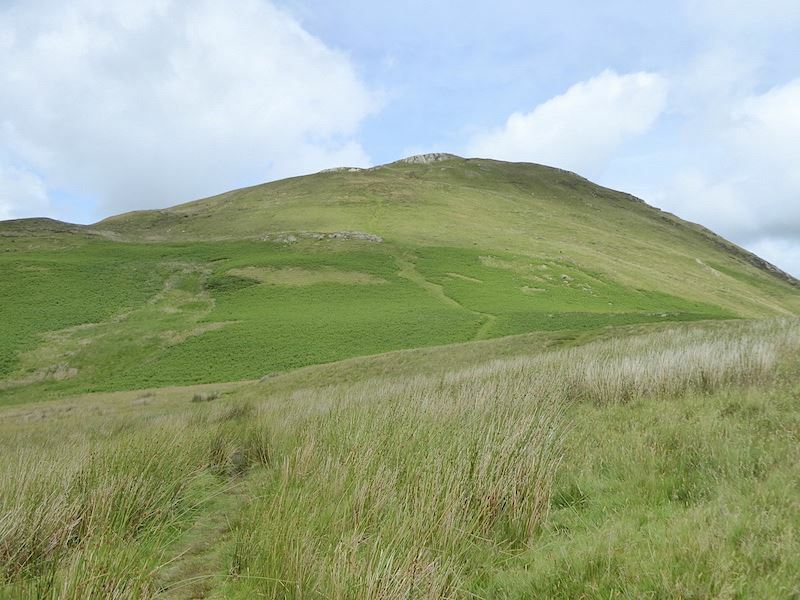 It doesn’t look like it but the path up to the top is very steep, one thing in its favour though is that is grassy not rough and rocky. 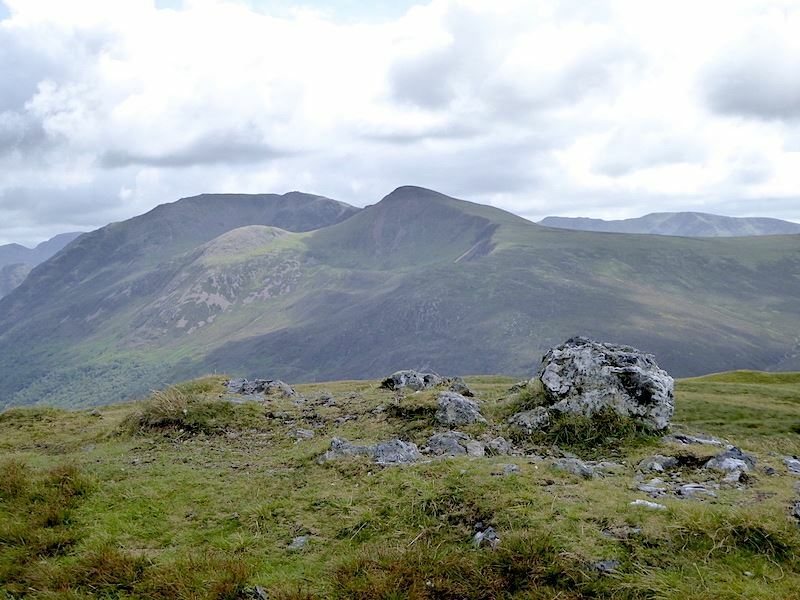 We didn’t go over to the top of Scale Knott on the outward leg but this is the view of the Grasmoor group of fells from the top of one of its little ridges. 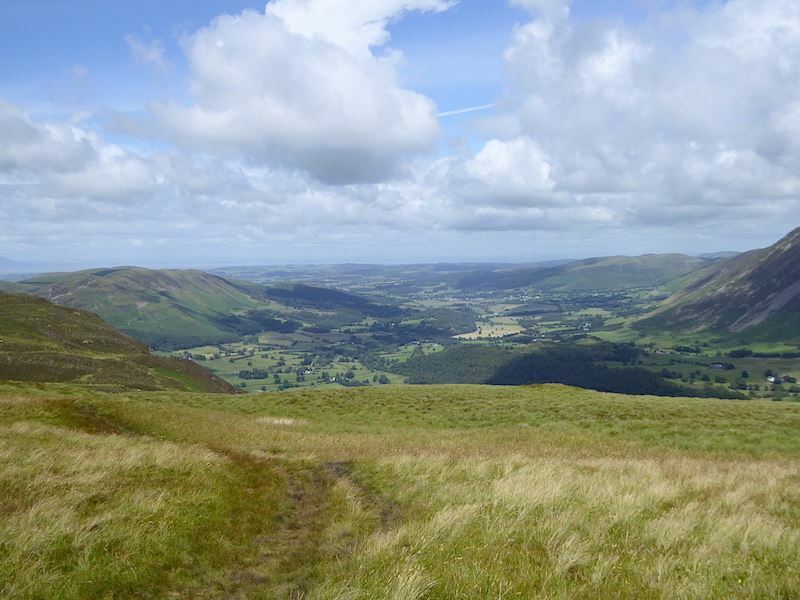 A look over to our left into Mosedale as we stop for a breather on the very steep path up to the top of Mellbreak. In some places the path was so steep that it became quite difficult to put your heels flat to the ground and walk in a normal fashion. 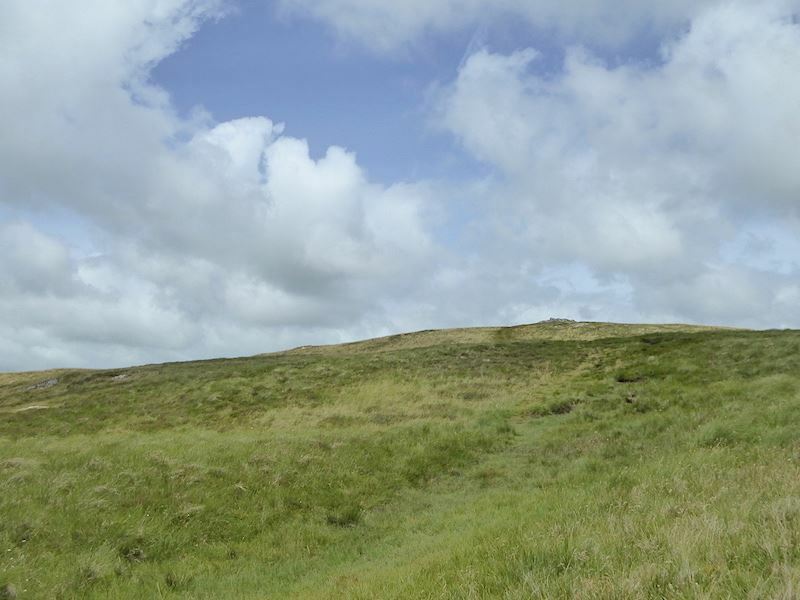 In places like that all you could do was teeter up them on the toes and the ball of the foot, very much to the dislike of the calf muscles which let us know about it in very short order. Happily there were not too many such sections, the rest of it was steep enough to be having to deal with. We climbed following our usual method, pick a spot, walk to it then take a breather. 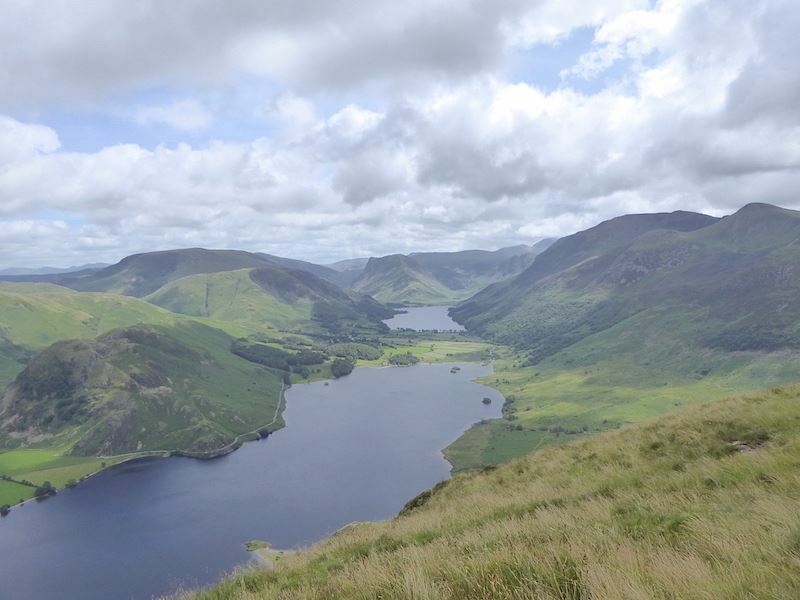 At one such pause for breath I moved off the path for this view down to Crummock Water with Buttermere beyond it. Another pause and a look over to our right at the Grasmoor group, with the huge bulk of Grasmoor taking up most of the space on the left. We are now beginning to meet lots of walkers who are making their way down the path we are on. Without exception, all of them taking the descent very slowly and carefully. Contrary to what one might think, going down a very steep hill is not easy either. You might not be gasping for breath any more but the legs, knees and ankles are taking a pounding, having to deal with the awkward angle of the slope itself and holding you upright and balanced, whilst keeping the brakes on to prevent gravity from gaining the upper hand and hurling everyone to the bottom. At last the gradient eases and the south top finally comes into view. The view northwards from the south top of Mellbreak. As we approached it from the right hand side of the shot we saw a young couple just leaving only to see the young woman darting back towards it just a few seconds later. You just knew she had left something behind and on reaching the rocky top where they had just been sitting I saw her bend down and pick up something. As she came towards me I could see she now had a camera slung over her shoulder so I said something along the lines of it was a good thing she realised she had left it behind, to which she replied with a laugh that it was even better that they hadn’t got down to the bottom before she remembered. 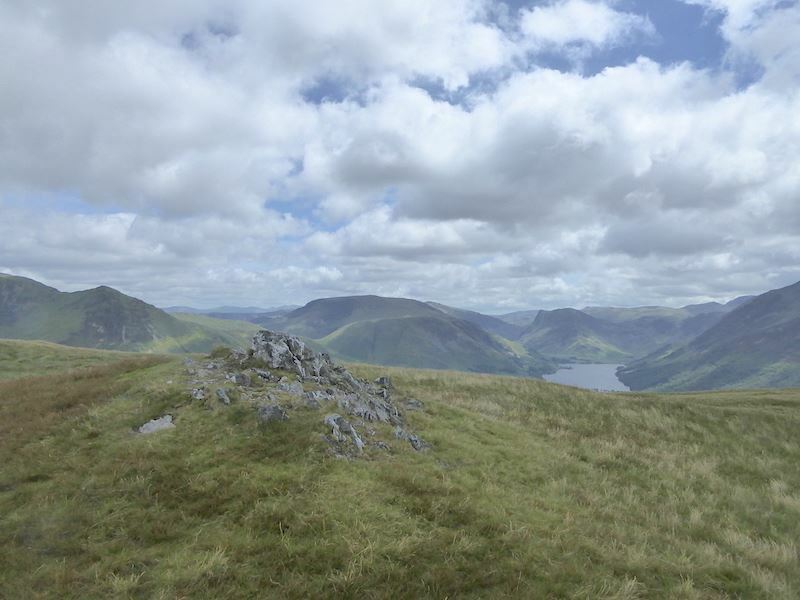 Its happened to most walkers I expect, I know I’ve left a trail of sunglasses on the fells over the years. 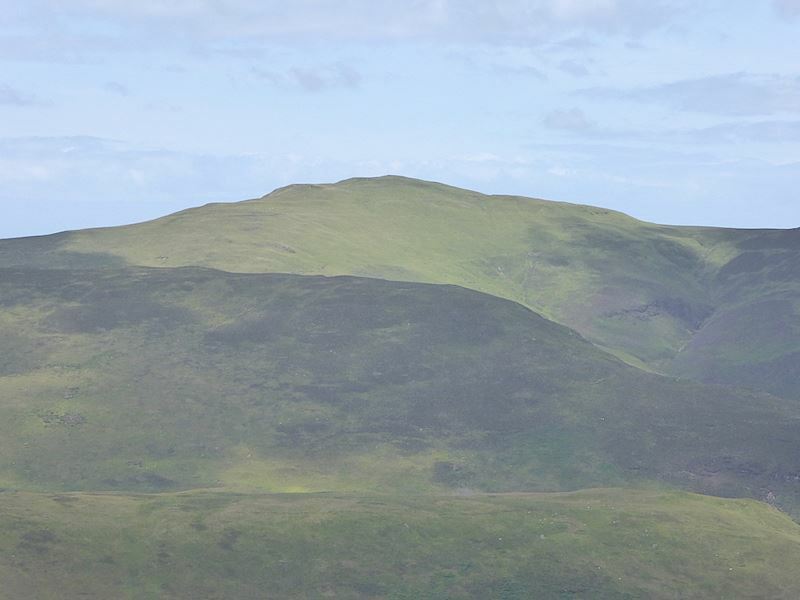 Looking towards the south west from the south top with Hen Comb immediately behind the outcrop. 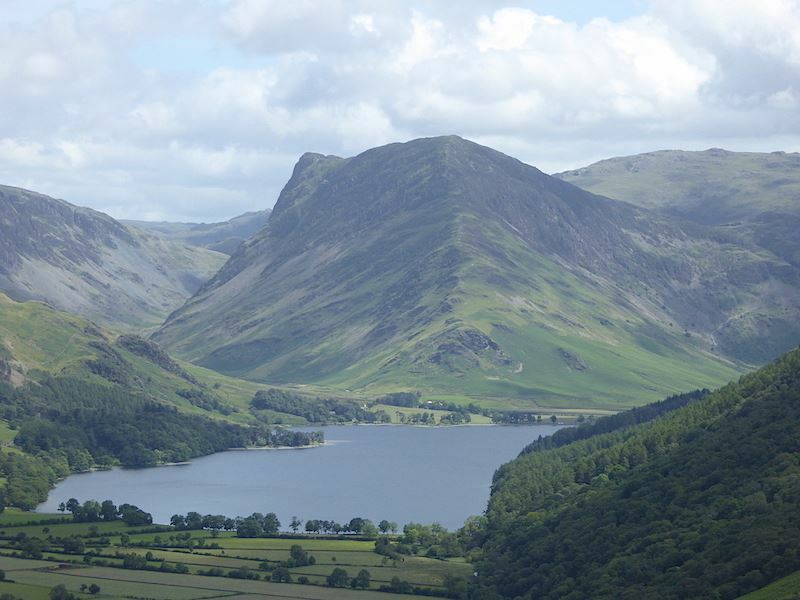 I took a short walk from the top over to the Crummock Water side of Mellbreak for a view of Whiteside, in the shade over on the left, Grasmoor in sunshine in the centre, and on the far right, the dainty little Whiteless Pike. 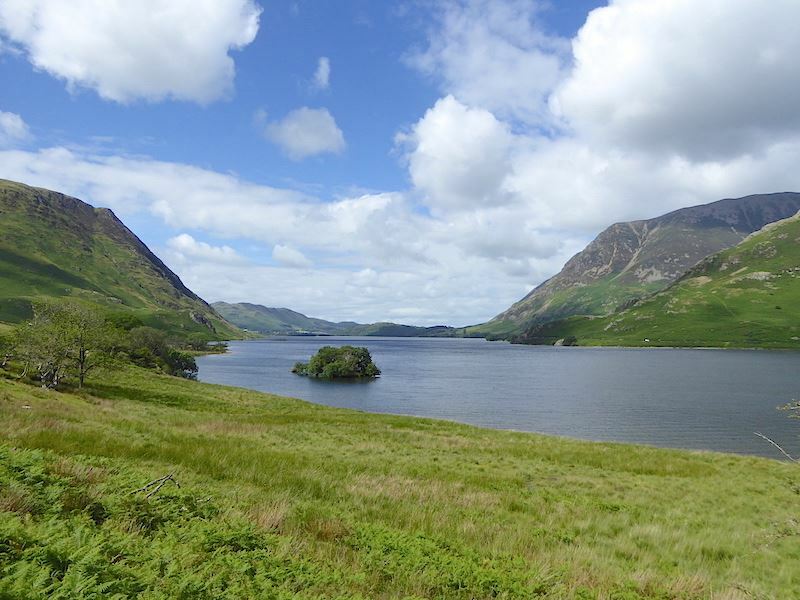 Turning northwards from the same spot and you get this lovely view along Crummock Water and Buttermere. 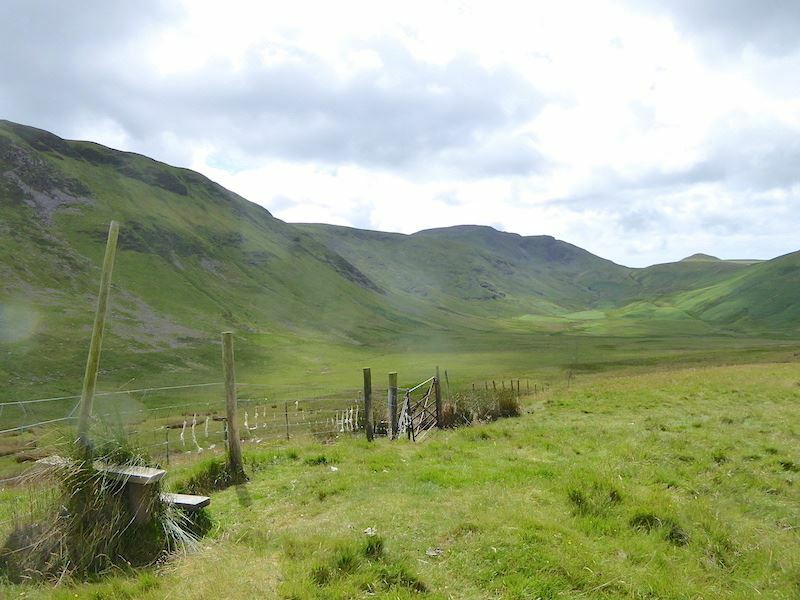 Down below is the road snaking around Hause Point, below Rannerdale Knotts, with its vehicles the size of midges. 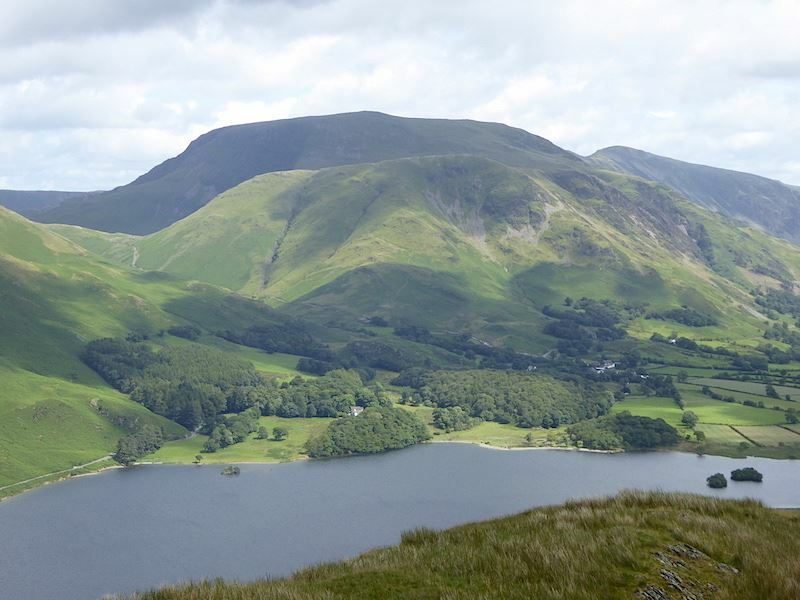 Beyond the trees around Buttermere village are High Snockrigg and then Robinson behind that. 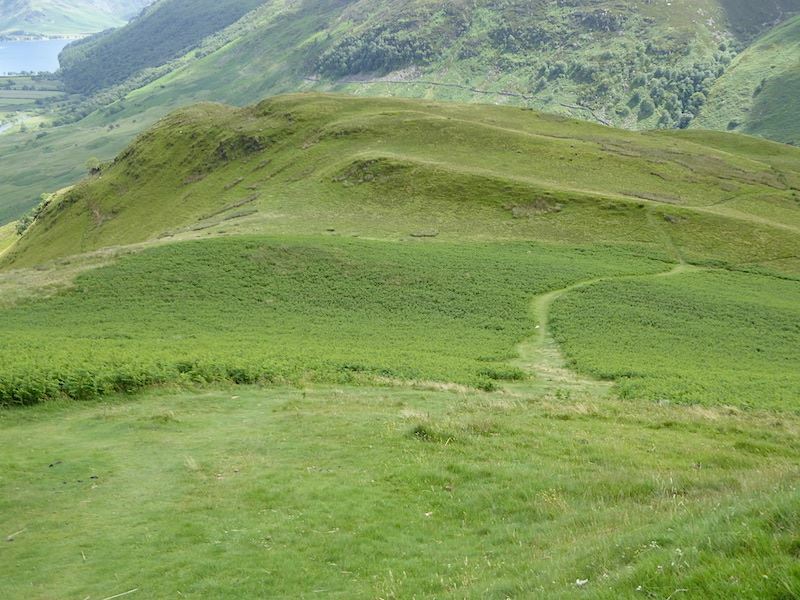 I return to the main path and we walk northwards along it for a little way towards the dip, or saddle, between Mellbreak’s two distinct summits. The north top is only a matter of a few feet lower than the south top. 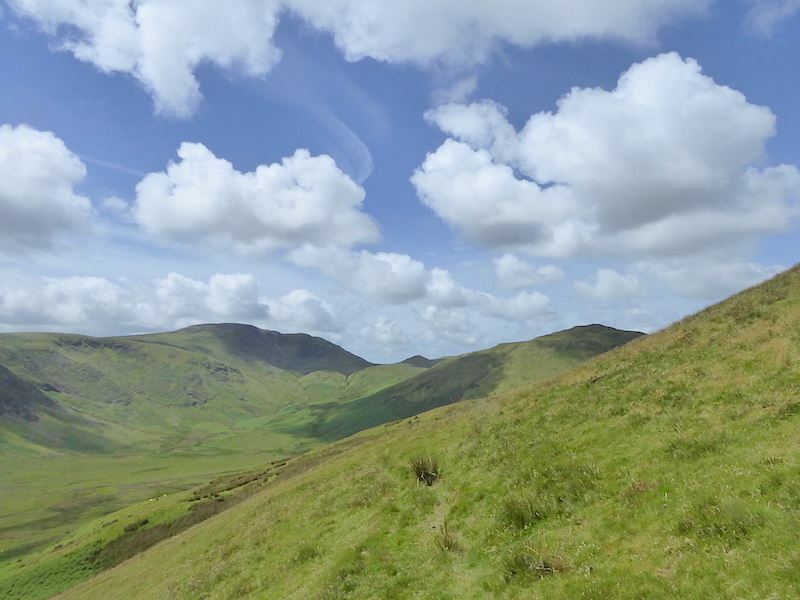 Way over in the distance to our left we catch sight of Gavel Fell catching one of the sunny spells …..
….. and over to the right is the lovely Lorton Vale with the west coast of Cumbria beyond it. If you’d like a view of the sea its just possible to see it if you zoom in. This was as far as we went and we waited a few moments until one of the sunny spells landed on the north top. It doesn’t look it but there were quite a few people making their way across from one top to the other. 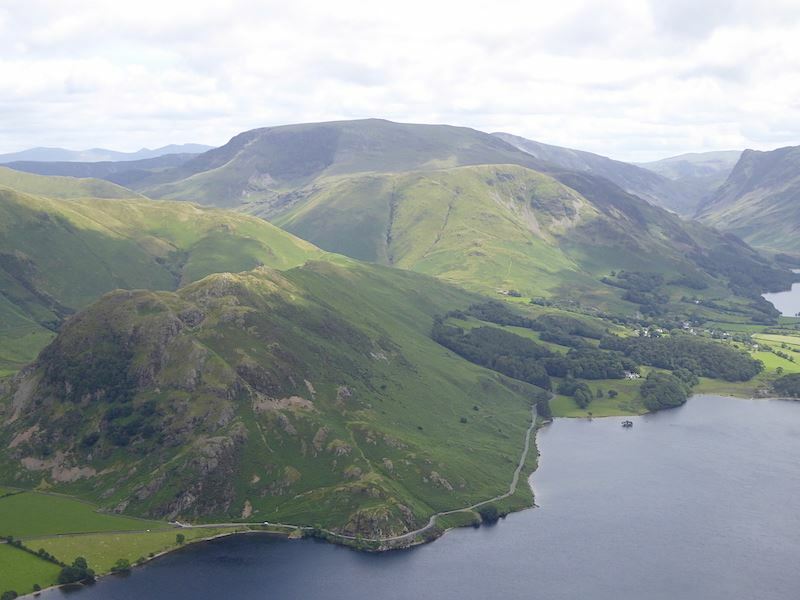 We could have returned to Buttermere from here by walking further down to the very lowest part of the dip and then taking a path running down to the left which would drop us down in Mosedale. 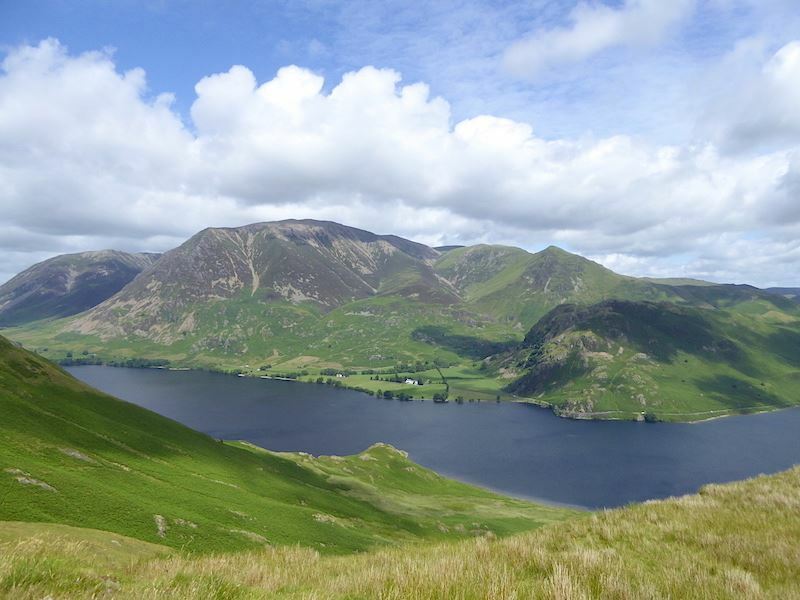 We decided against that as it is only a couple of weeks since we walked the Mosedale path, and neither would we have the fabulous views along Crummock Water and Buttermere which are on offer if we simply turn round, retrace our steps back to the south top and descend from there. 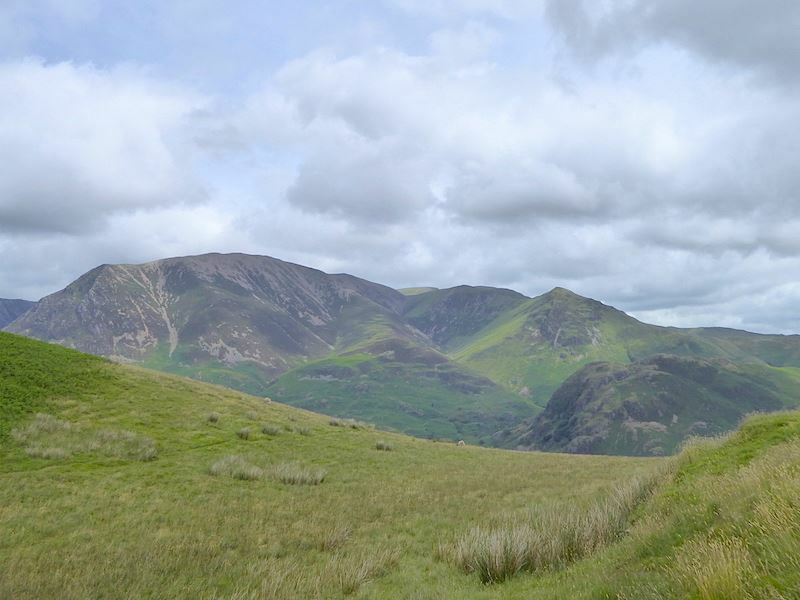 So we turn around and begin to make our way back to the south top with a view of the Lorton Vale ‘twins’ – Whiteside to the left and Grasmoor to the right. 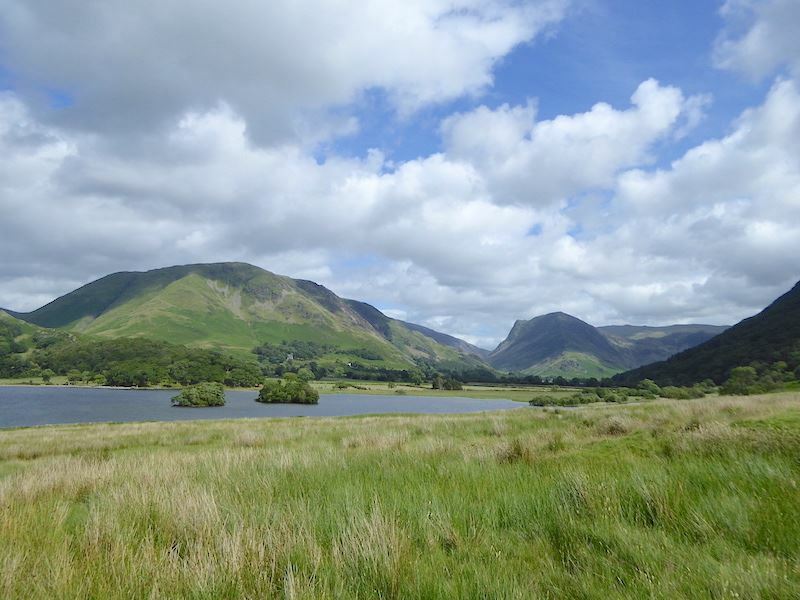 The Loweswater fells on the skyline getting another sunny spell, with the long shaded ridge of Hen Comb between them and us. 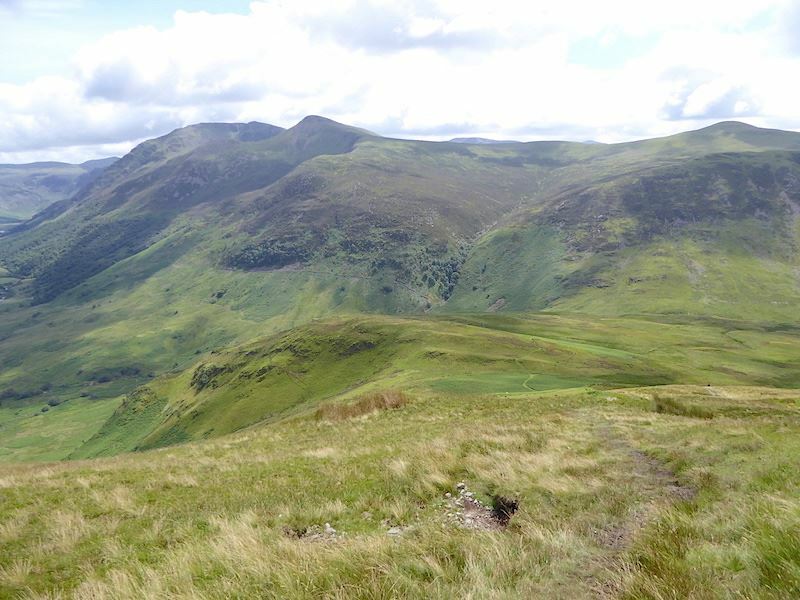 Back at the south top and the opportunity to view the corrie, containing Bleaberry Tarn, below Red Pike. 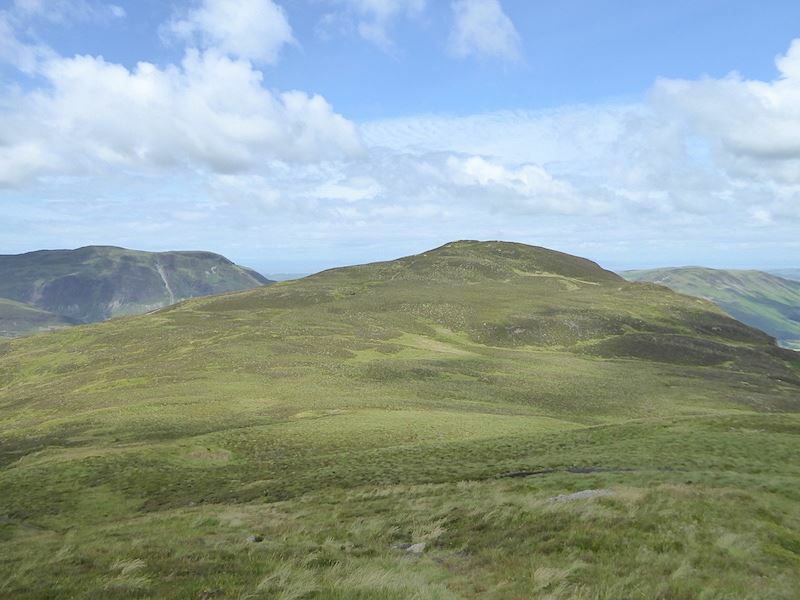 The distinctive bowl shape of the corrie, although in the shadow of Red Pike, is clearly visible and to the left of it is the sunlit little summit of Dodd. To the west of Red Pike another sunlit fell, this time its Starling Dodd, we haven’t been over there for a few years too. We really will have to get over there before much longer. 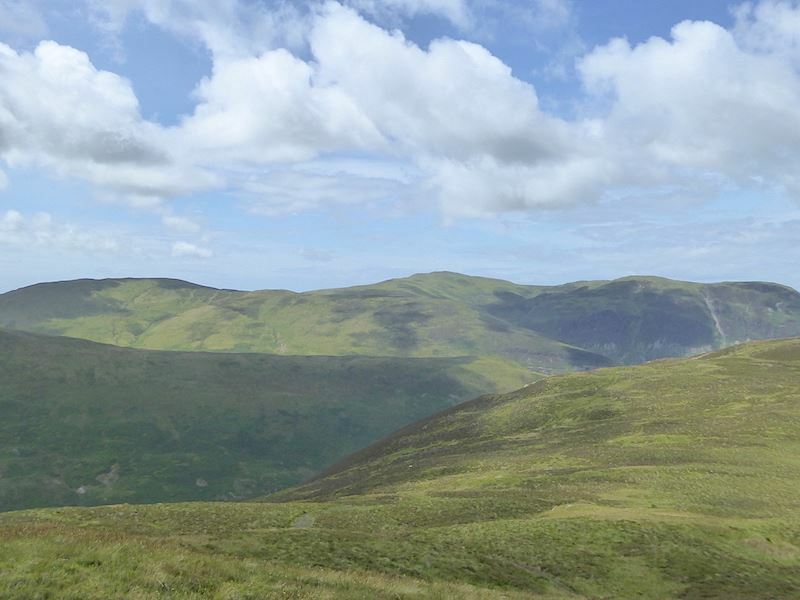 On the skyline behind are some of the fells around Ennerdale, yet another area we have neglected for far too long. Now, it might be sunny but it ain’t arf windy, and don’t run away with the idea that the trouser legs are rolled up because its a hot day because it isn’t, well not up here it isn’t. I rolled them up before we started climbing the mucky path beside Scale Beck as I didn’t relish the idea of having muddy, wet trousers flapping round my ankles for the rest of the walk. 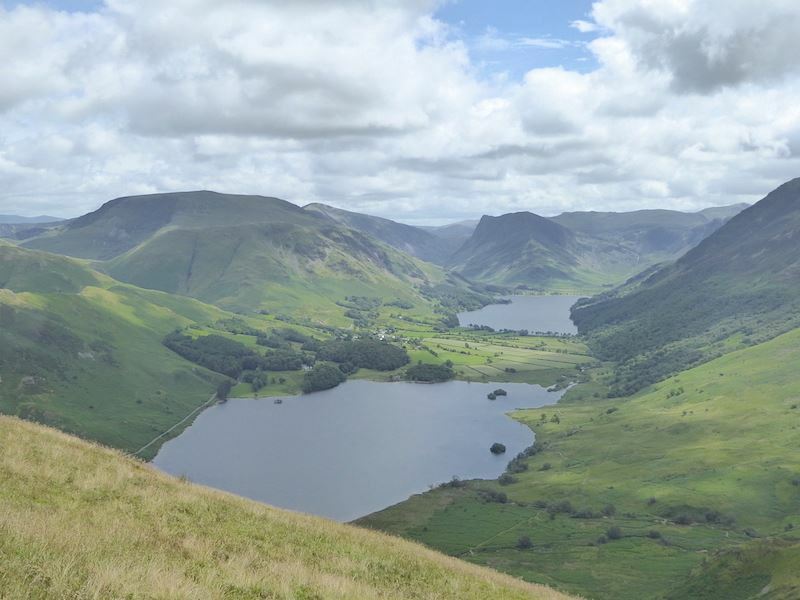 Another look at the superb view along Crummock and Buttermere and then we begin to make our way back down. 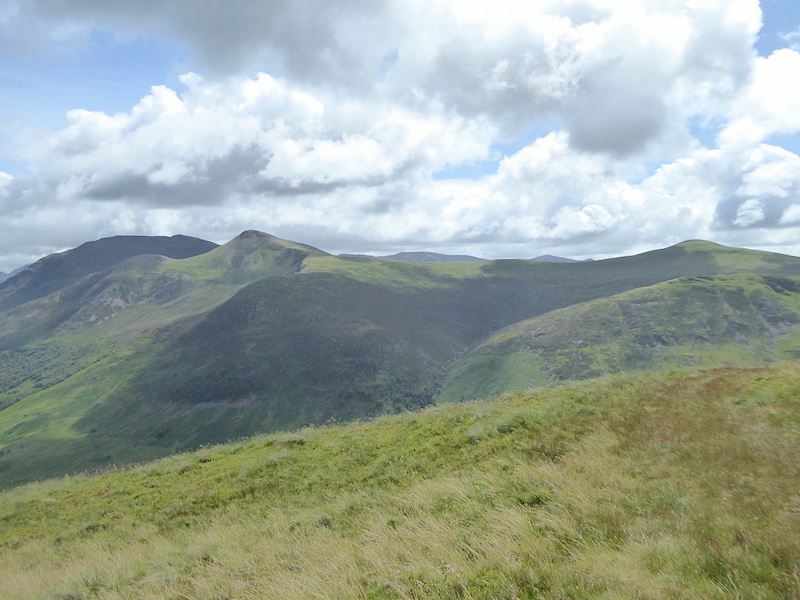 We take to the path again and ahead of us is the long sweep of ground between Red Pike, on the left, and Starling Dodd, on the right. 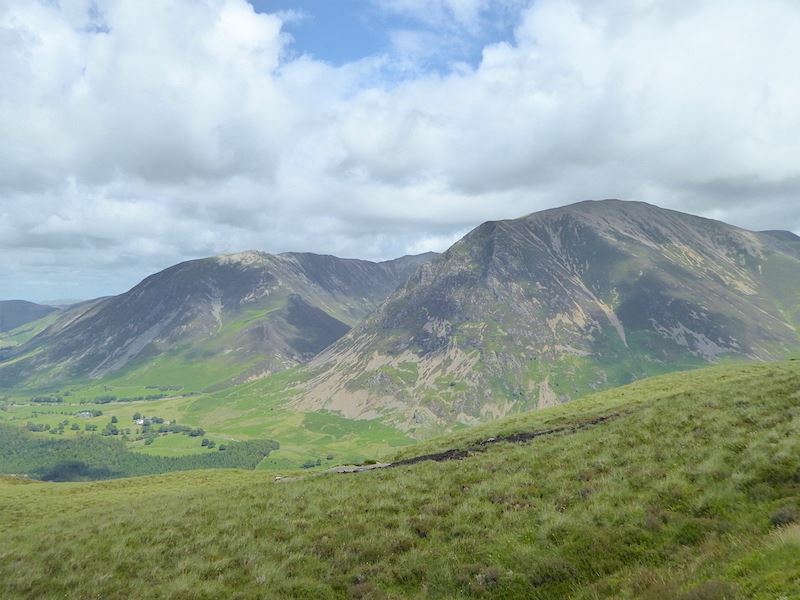 The mound immediately below us is Scale Knott and, having bypassed it on the way up, that’s where we’re heading for next. A look back up to check on progress, slowly does it as the recovering foot is still not really happy when descending anything towards the steepish end of the scale. Descending the steep upper section and making for the little outcrop over towards the lower right of the shot. 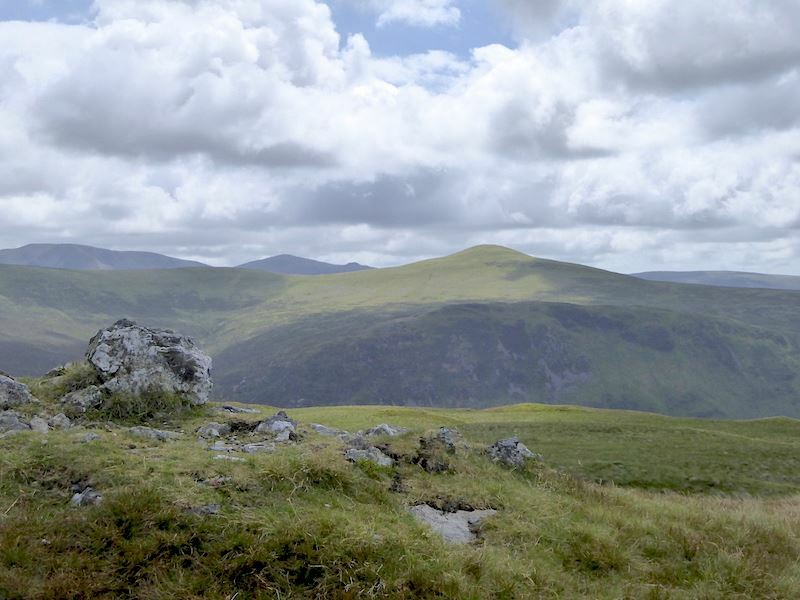 The ground levels out slightly at the outcrop which gives you the chance to stand comfortably, and give the ankles and knees a rest for a minute or two, before heading down the next steep bit. 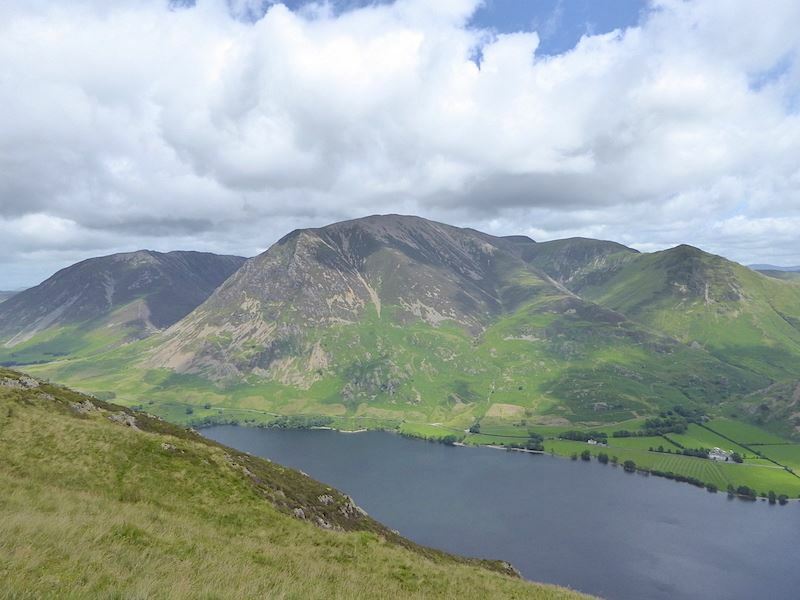 Back down to Scale Knott and a view of the Grasmoor group across Crummock Water …..
….. the fells alongside Crummock Water and Buttermere …..
….. a long zoom for a good look at Fleetwith Pike at the head of Buttermere …..
….. and a look over towards High Snockrigg and Robinson. 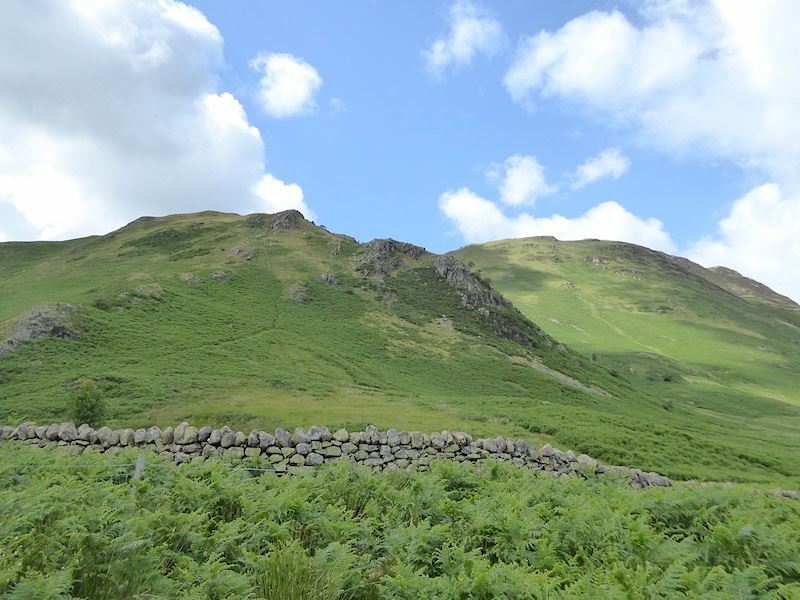 Back at the stile I take another look along Mosedale …..
….. and a last look back up to Mellbreak before we cross the fence and begin the walk back down the squelchy, muddy path back to the lakeshore. You might just be able to pick out a couple of walkers ahead of us, towards the bottom right, who were also having quite a struggle with the route. Every now and again you would see one of them doing a quick correction as they began to slither in all the wetness. 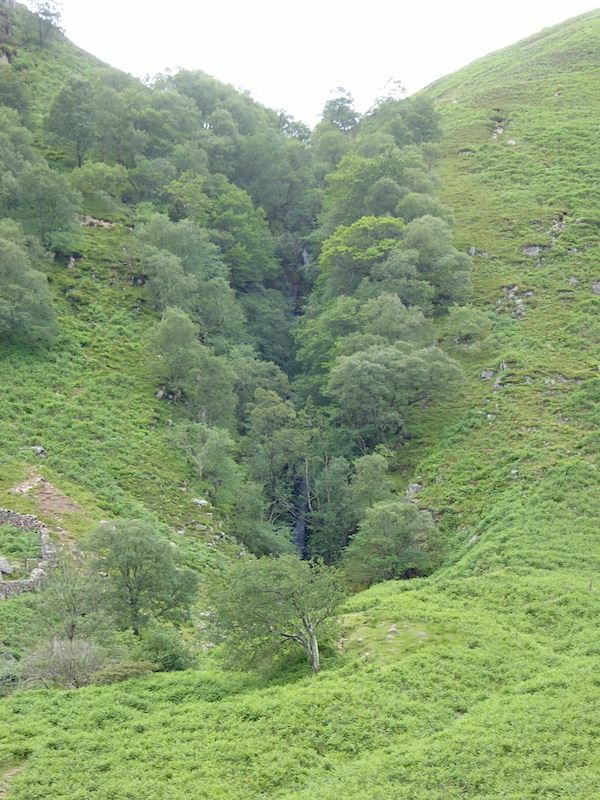 Across from us is the deep tree lined gorge containing Scale Force, reputed to be the highest waterfall in the Lake District with a single drop of 170′ and two others of about 20′. 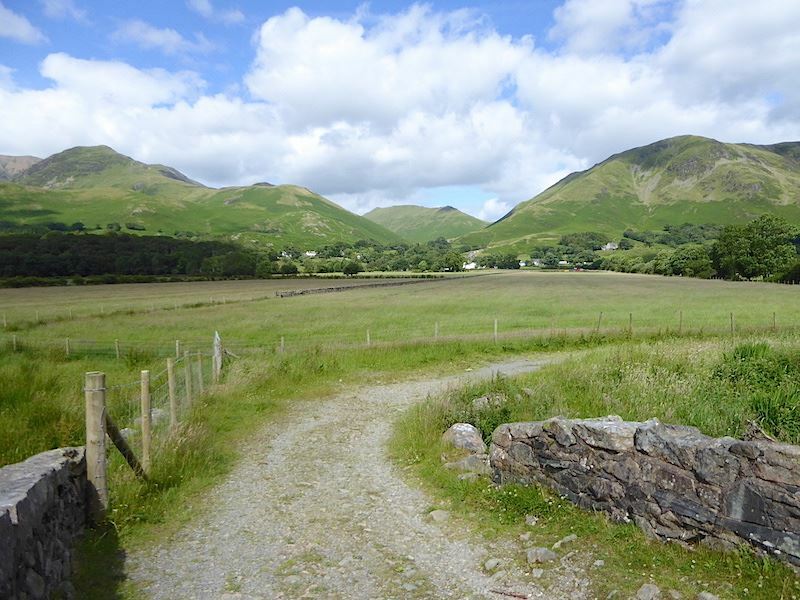 There is a path up to it and its a popular tourist attraction as its only a relatively short walk from the village. Obviously its best viewed in autumn or winter. Since the trees are in full leaf now it is difficult to see them but zooming in might just reveal a couple of sections of the Force. A look back to the Scale Force gorge. The bright green vegetation on this side of the footbridge is an indicator of how very wet this particular section was. 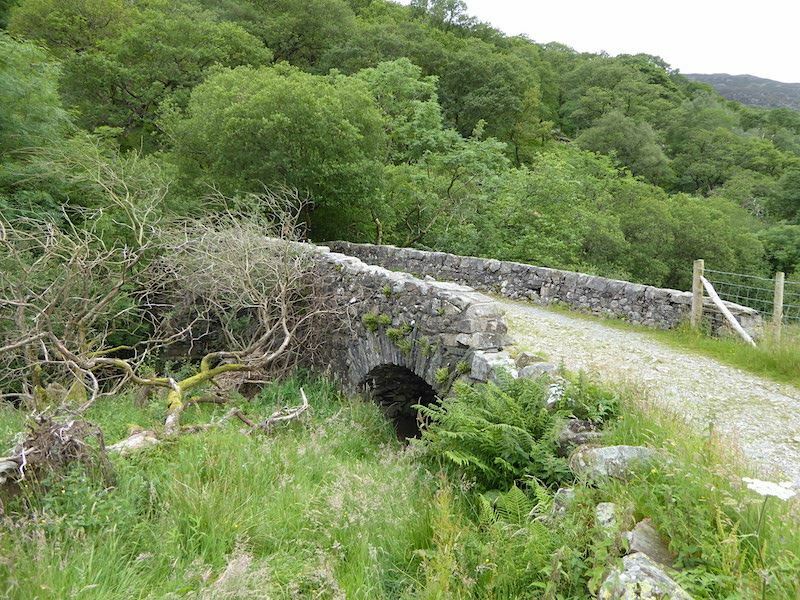 We didn’t need to cross the bridge, it was just a case of keeping to the path we were on and crossing the beck much lower down. 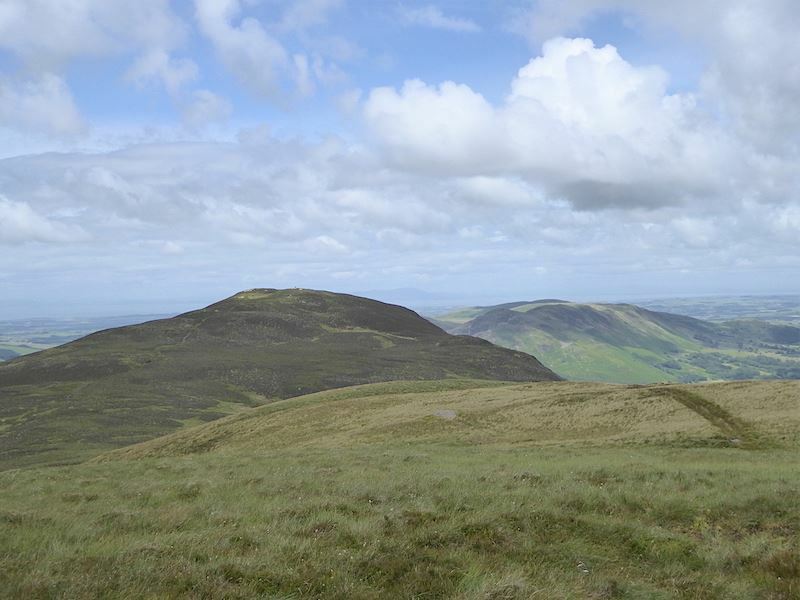 Back down on solid ground again and a look back at Scale Knott and Mellbreak. 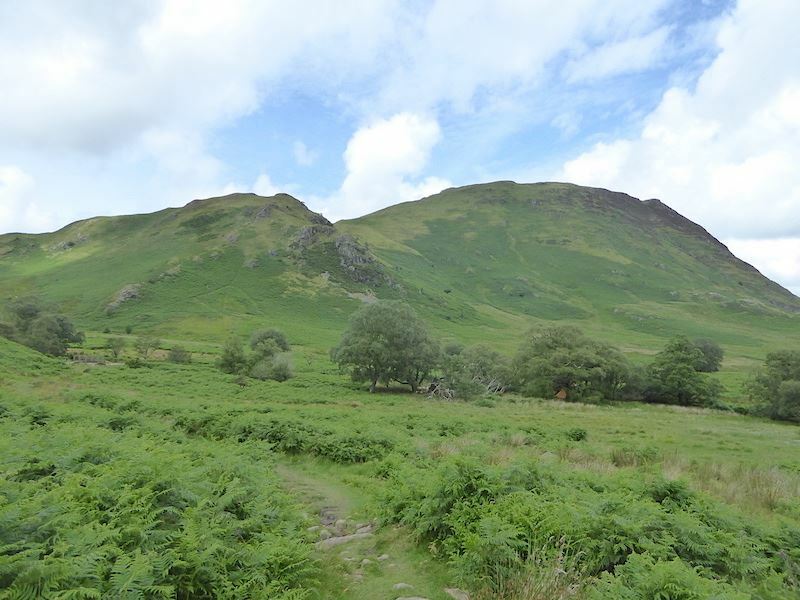 On level ground now on the lakeshore path where we met a retired chap from Bury who had been marshalling for the Saunders Mountain Marathon event over the weekend and was staying on for a couple of days doing a spot of wild camping. 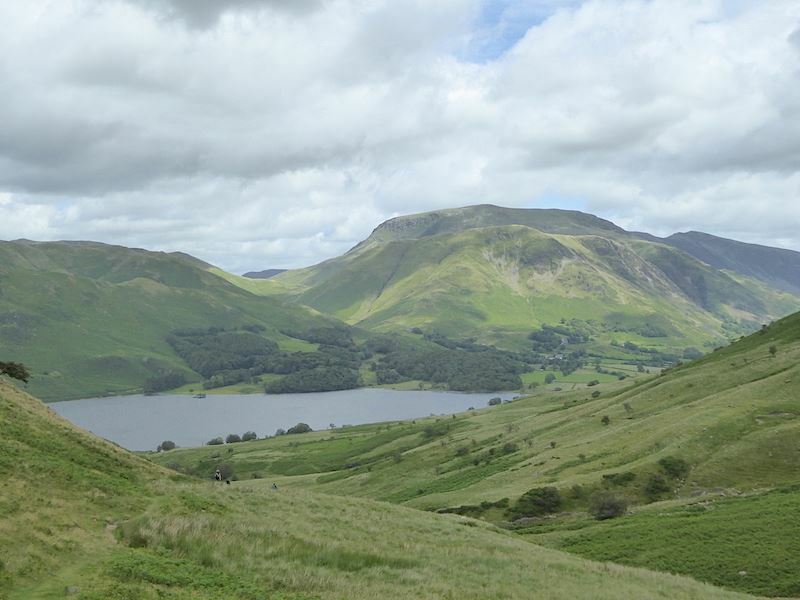 He was heading up to Mellbreak’s south top and then dropping down to the Kirkstile Inn to pick up some supplies before camping in the woods at the northern end of Crummock Water. 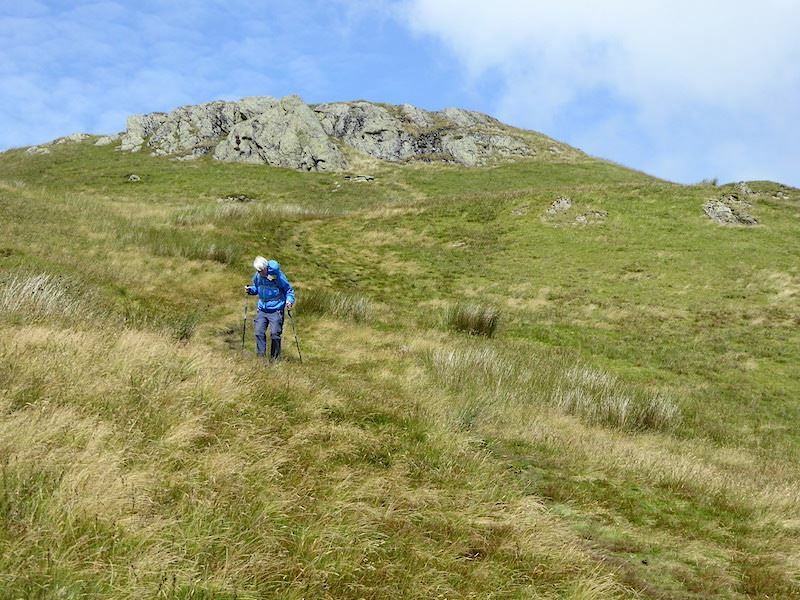 Having seen the size of the pack he was carrying I didn’t envy him the steep climb up to the south top. He was a very nice, friendly chap and we had a good old chat for a while before wishing each other a safe journey and parting company. 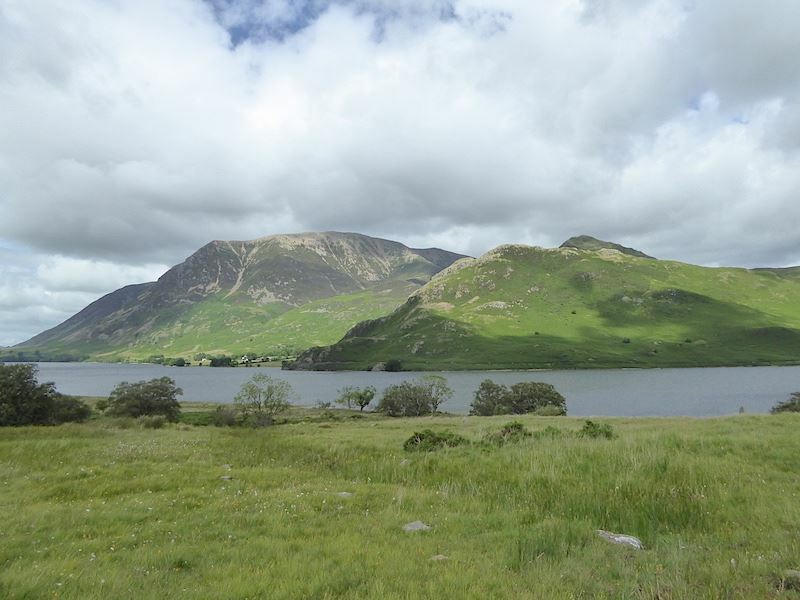 A look back along Crummock Water to Scale Island, roughly the point at which the path for Mellbreak begins to veer away from the lakeshore path. 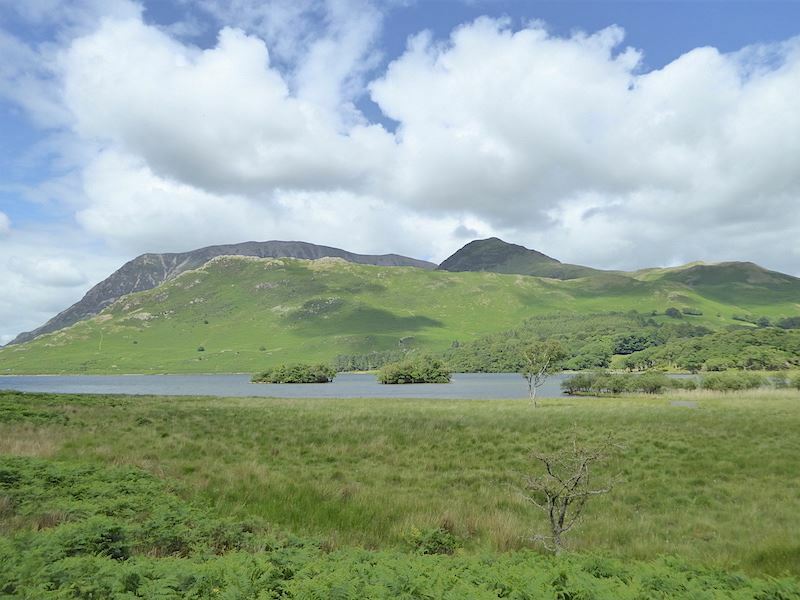 Two more islands on our left rising out of Crummock Water, these are Holme Islands. 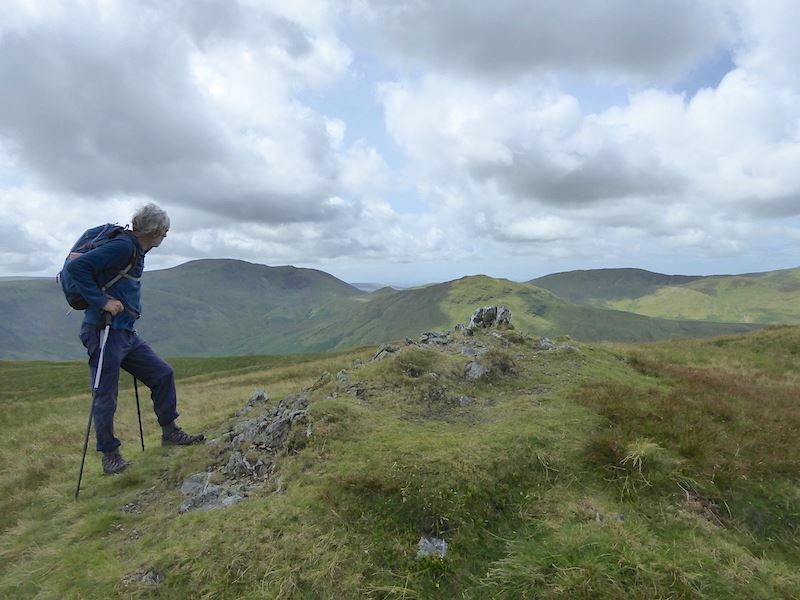 Over to our right and a look up at Red Pike, the high point on the skyline, which will disappear behind Dodd, in the centre, after another few minutes walking. 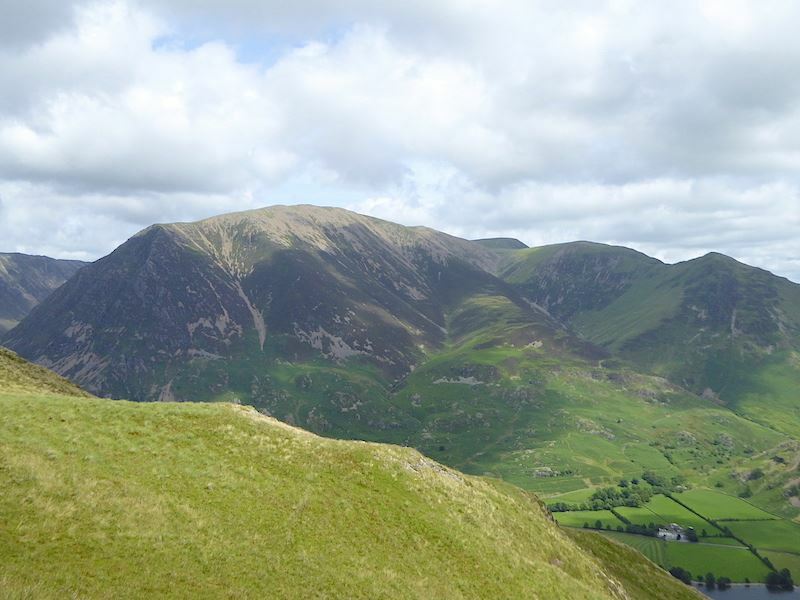 Beyond Holme Islands is the long ridge of Rannerdale Knotts with Grasmoor and Whiteless Pike peeping out behind it. 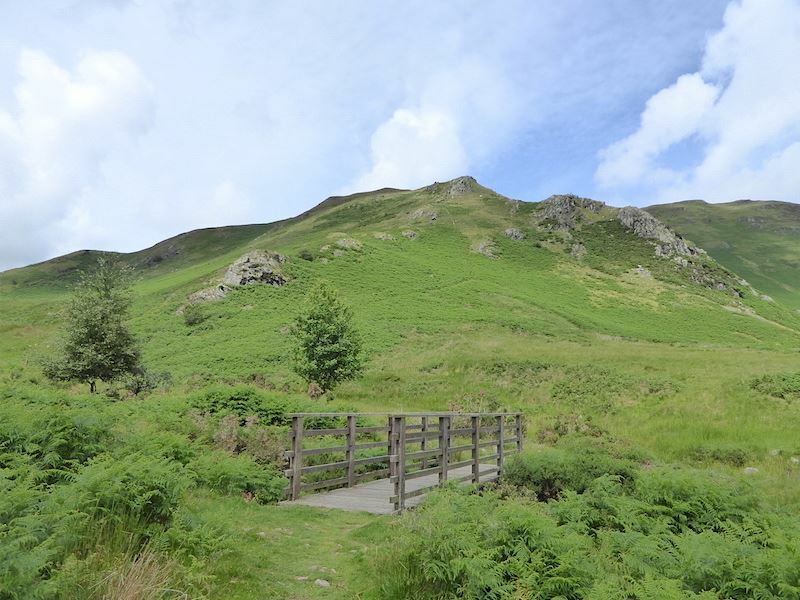 Crossing Scale Bridge again with the Knott Rigg to Ard Crags ridge appearing on the centre skyline. 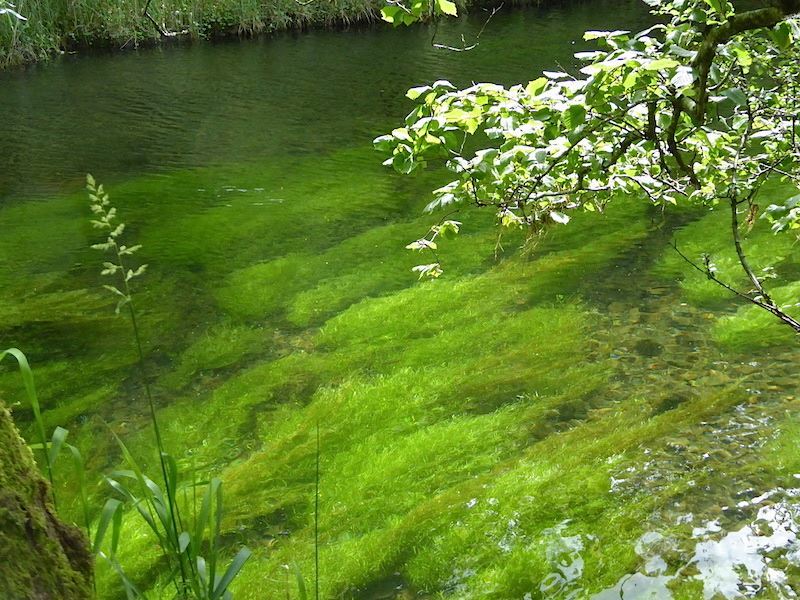 The sunlight falling on the vivid emerald green of these underwater plants growing in Buttermere Dubs caught my eye just after we crossed the bridge. I’m no botanist so I have no idea what they are but the whole scene was really enchanting as the water flowed silently over the gently swaying fronds. 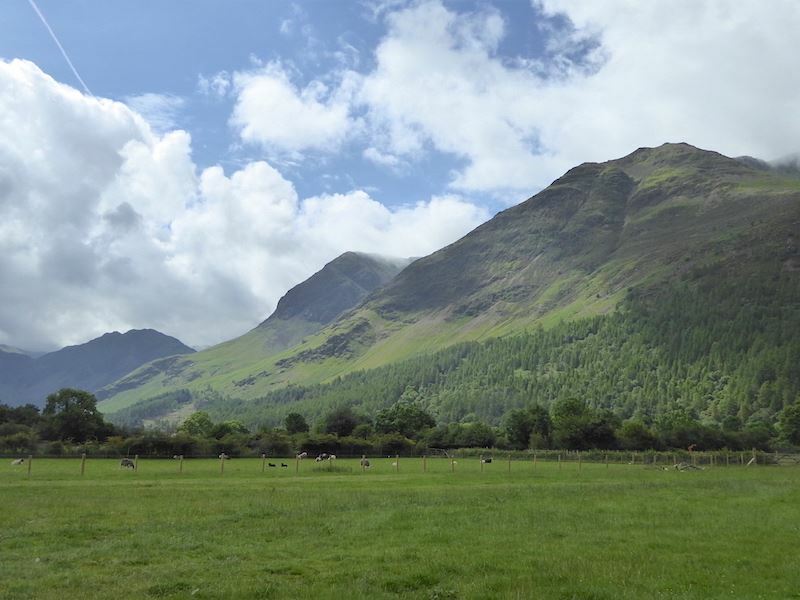 Continuing on the track beside the field and approaching Buttermere …..
….. but before reaching the village, and losing the view, a shot of Fleetwith Pike, on the left, Haystacks, on the right, with Grey Knotts, Brandreth and Green Gable stretched out between the two. We decided to treat ourselves to an ice cream so we walked up the hill to Syke Farm only to find a queue stretching from the cafe all the way back to the gate by the roadside. Its our favourite ice cream but even so we weren’t about to stand there for a while to get one. Back we went round the corner to the Croft Farm Cafe where there was no queue and bought some of theirs instead. Almost as good and, dare I say it, a whole lot more raisins in their rum and raisin variety.